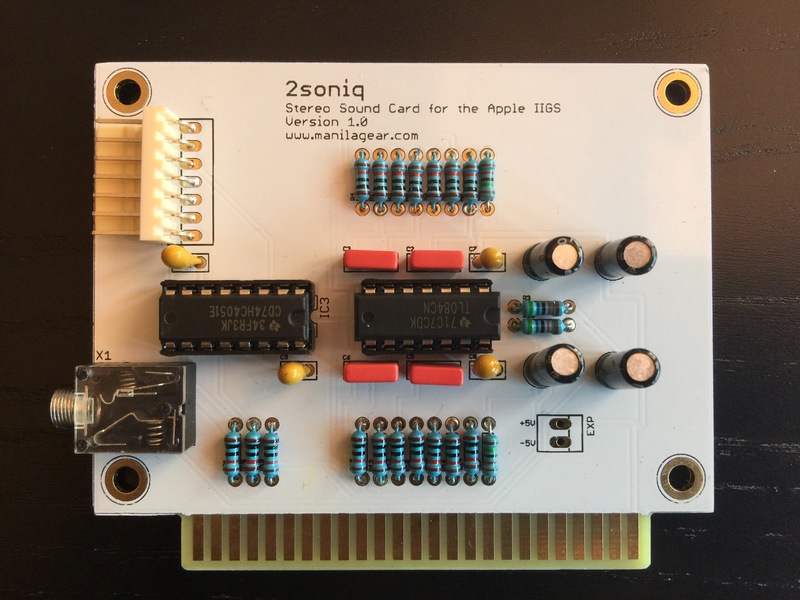 Mountain View, CA, 7 April 2017 — Manila Gear today announced the 2soniq interface card for the Apple IIGS. 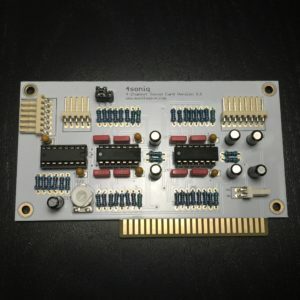 The card gives IIGS owners the ability to connect 2 powered speakers so they can enjoy stereophonic sound. This is a simpler version of the 4soniq – the quadraphonic sound card with a monophonic input digitizer that the company released almost a year ago. 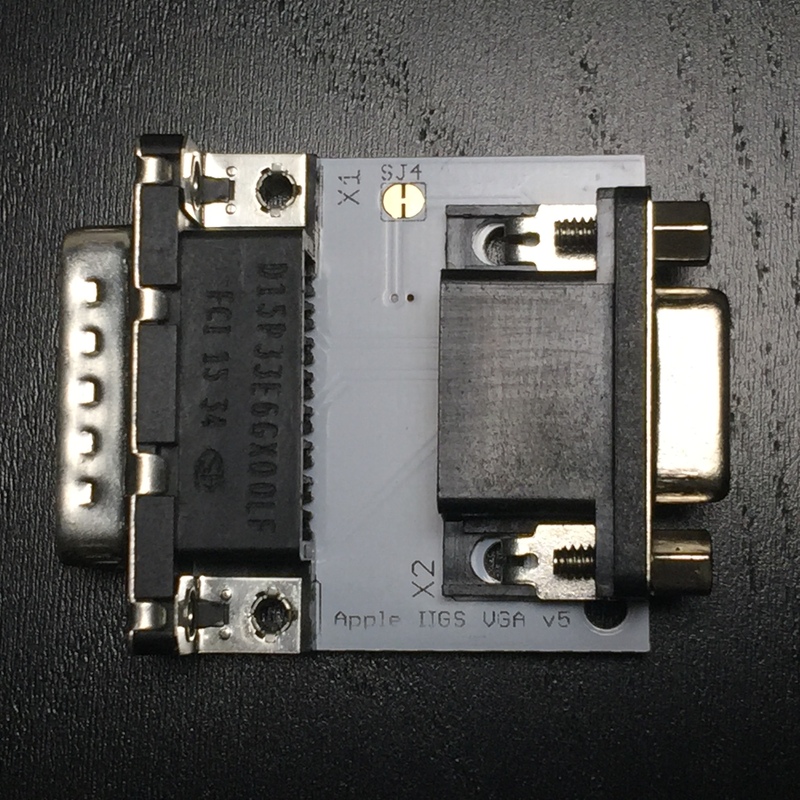 Hardware – The 2soniq unlocks the capabilities already available in the Apple IIGS’ Ensoniq Digital Oscillator Chip. The simple design and robust engineering delivers clean, reliable sound. It features 2 channel output via one 3.5 mm stereo jack. Similar to the 4soniq, the 2soniq can also be setup for slotless operation. Software – The 4soniq Programmer’s Guide is available on the Manila Gear website. The guide shows developers how to program for both the 2soniq and the 4soniq, and includes sample code on how to modify existing software to support multi-channel sound. 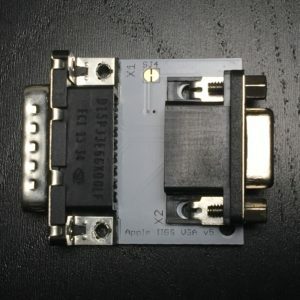 The 2soniq is now on sale for $69++ at the ReActiveMicro online store at http://store.reactivemicro.com/product-category/49/apple2/iigs/. For more information on the card specifications please visit https://manilagear.com/product/2soniq-stereo-sound-card. In February 2017, Manila Gear contacted ReActiveMicro about working together to bring their projects to the Apple II Community. Manila Gear wanted to make sure their current and future products continue to be available to the community at scale. ReActiveMicro was Manila Gear’s first choice since they are the most experienced and longest lived Apple II vendor currently active in the Apple II Community. Starting from April 2017, ReActiveMicro will be selling and supporting all the great items available from Manila Gear. 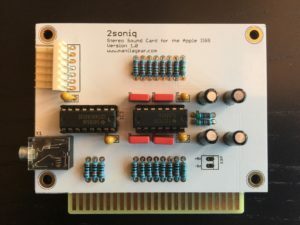 These will include the new 2soniq stereo sound card, the popular Apple IIGS VGA Adapter, and a refreshed version of the 4soniq 4-channel sound card. Manila Gear is an electronics company founded by Jon Christopher Co and John Valdezco. Jon has been a hardware hacker for the past twenty years and maintains a blog at http://damntechnology.blogspot.com.au. John advises Silicon Valley startups, and has a degree in Electrical Engineering. Both Jon and John attended Philippine Science High School, and have been working together on cool stuff since then. ReActiveMicro was formed by Henry S. Courbis in 2005 as a division of Reactive. Since 1990 the parent company Reactive has had many different divisions. They have worked with hardware, custom software, auto security and sound, auto repair, pay phones and electronics to name a few. Henry’s current project at Reactive Computers is related to the Apple II and Arcade systems. He also plans on teaming up and working with others to provide new solutions for the Apple II Community. This entry was posted in General on April 7, 2017 by John Valdezco.